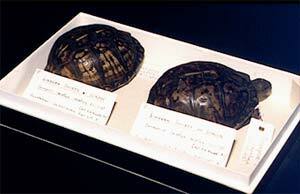 Tortoise shells from Linnaeus’ collections in London. Photo: Hans Odöö. All the time new species are discovered. They have to be described and given scientific names. The names are then used in many different ways by people who work with plants and animals. It is therefore very important to know exactly which plant species each specific name is tied to. The name of the new species has to be published in a scientific journal. To show exactly what plant or animal the name refers to, a reference to a collected specimen of the species, a type specimen, is given. Even though the author of the species always tries to make an accurate description of the species, it is important that other scientists can see the specimen with their own eyes. The type specimens are kept in scientific collections in museums. In the past there was no rule about type specimens. Linnaeus described thousands of species without telling what individual he had looked at. To be certain of what he meant some detective work has to be done to try to find out what specimens he had studied. Often the answer is found in Linnaeus’ own collections of plants and animals, or other collections he had studied. Most of those collections are today found in London, but also in the herbarium (plant collection) of the Swedish Museum of Natural History and in the Zoological Museum at Uppsala University.